Solid presentations should be built around three fundamental pillars to have consistency. These pillars are the content, the design and a good exposure. The presentations that inspire and impact the audience are those that have a balance between the quality of the content, a good design and a passionate exhibition. Content: Prepare a good content for your audience, which is of quality. Build your presentation around an innovative main idea and prepare it in depth. Provide real data that you have contrasted and original messages. Give examples, these help’s a lot to understand the message and its retention. Design: Work in depht the design of the presentation, a good design is essential to expose the content in a clear, visual and understandable way. Good content should be accompanied by good visual support, since no, you can tarnish the exposure. 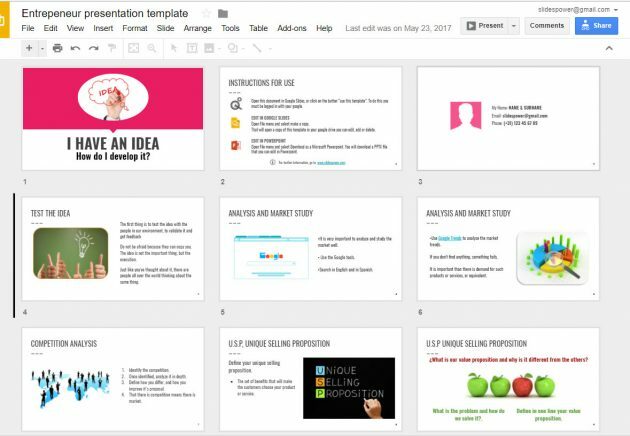 You can use a Google slides theme to complete this phase in a simple and professional way. Exhibition: Communicate with passion helps the credibility of the message and reach its audience. In addition to communicating with your words to transmit passion, help with your body and voice. A good intonation gives force to the message. Connecting with the audience: is essential for your message to arrive, be remembered and be remembered. The first thing to do to connect with the audience is to know it. Therefore, before building your presentation, worry about knowing who your audience will be so you can help prepare your presentation. Find the points in common with your audience that will help you to address them. In this way you will know what language and tone you should use, whether more technical or simpler. It is not the same to address students, elderly people or technical personnel, etc. Direct and maintain the attention of the attendees: To achieve this, we must include in the design of the presentation the elements that attract attention and channel our audience towards the messages that will be transmitted to us. For this, the Google templates slide with the large number of options for it. Get the understanding and the memory of the message: Make clear and concise messages, that is, synthesize in a few words the idea you want to convey. This makes the messages easily understood and remembered. Select very well the data that you want the audience to retain. Once the previous steps are completed, it is time to translate them into the slides that will compose your presentation. In this phase of the presentation, the first thing you have to do is choose a theme that is as consistent as possible to the message and the topic you are going to convey. If your presentation is about a creative theme, do not choose a professional presentation with a sober theme. There are pages like slidespower.com where you can find Google slides themes to cover projects on a wide range of topics. In addition, all their slides are customizable, allowing you to adapt them to any presentation. A differential value that I found at www.slidespower.com that had not been seen so far, is that the presentations they offer, are in themselves, a guide on how to carry out a good presentation. In each of the slides that make up their presentations, they give the keys of how to present the content, the photos, the data, etc. In addition, they also offers themes of presentations of very specific themes, such as Valentine’s Day, the American Civil War, Halloween, etc.